15-M5 Fairing Bolts in 3 sizes for Body Panels, Fairings, and Windshield. 15-M6 Fairing Bolts in 3 sizes for Body Panels, Fairings, and Windshield. 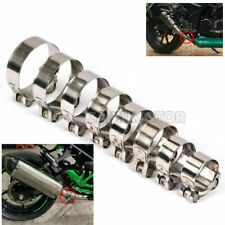 Tailored for all Yamaha Kawasaki Suzuki & Honda Sportbikes. X16 Allen Head Windscreen Bolts. 15-M5 Fairing Bolts in 3 sizes for Body Panels, Fairings, and Windshield. 15-M6 Fairing Bolts in 3 sizes for Body Panels, Fairings, and Windshield. 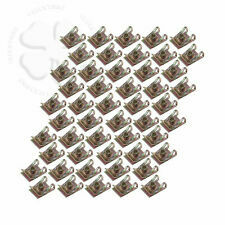 Selection of Reduced Head M6 Flange Bolts for small parts and engine covers. Full windshield bolt kit including 6-M5 Well Nuts, 6-M5 Nylon Washers, and 6-M5. Detailed kit contents shown below. These kits are designed to work with most all Japanese Sportbikes and therefore may not contain everything for one specific model. Tailored for all Yamaha Kawasaki Suzuki & Honda Sportbikes. 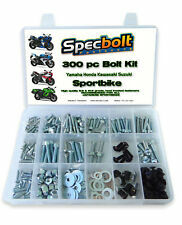 Full windshield bolt kit including 6-M5 Well Nuts, 6-M5 Nylon Washers, and 6-M5. Detailed kit contents shown below. Dish Head M8 Flange Bolts for larger parts. NOS new OEM Yamaha plastic rivet. 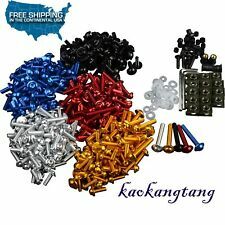 100% ALL FACTORY FRESH NEW FASTENERS TO MAINTAIN YOUR JAPANESE SPORTBIKE. These kits are designed to work with most any Japanese Sportbike and therefore may not contain everything for one specific model. 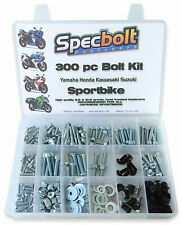 1 Kit = (30) Spike Bolts [10x 5mm / 10x 6mm / 10x 8mm Spike Bolts], (10) 5mm Wellnuts, (30) Washers. Spikes: Blue, Anodized Aluminum, CNC Machined. When you need parts, you can count on PlanetBolts! We do ask that the item is unused and unmodified. 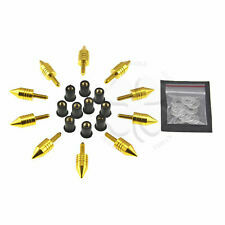 1 Kit = (30) Spike Bolts [10x 5mm / 10x 6mm / 10x 8mm Spike Bolts], (10) 5mm Wellnuts, (30) Washers. Spikes: Black, Anodized Aluminum, CNC Machined. When you need parts, you can count on PlanetBolts! CNC Precision machined aluminum Spikes to replace OEM fasteners. 1 Set = 10 Spike Bolts and 10 Washers. 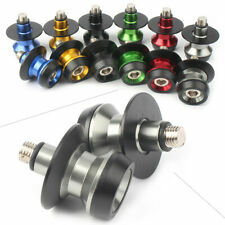 Spikes: Blue, Anodized Aluminum, CNC Machined Washers: Nylon. We do ask that the item is unused and unmodified. CNC Precision machined aluminum Spikes to replace OEM fasteners. 1 Set = 10 Spike Bolts and 10 Washers. Spikes: Blue, Anodized Aluminum, CNC Machined. We do ask that the item is unused and unmodified. CNC Precision machined aluminum Spikes to replace OEM fasteners. 1 Set = 10 Spike Bolts and 10 Washers. Spikes: Silver, Anodized Aluminum, CNC Machined Washers: Nylon. We do ask that the item is unused and unmodified. CNC Precision machined aluminum Spikes to replace OEM fasteners. 1 Set = 10 Spike Bolts and 10 Washers. Spikes: Black, Anodized Aluminum, CNC Machined Washers: Nylon. We do ask that the item is unused and unmodified. CNC Precision machined aluminum Spikes to replace OEM fasteners. 1 Set = 10 Spike Bolts and 10 Washers. Spikes: Gold, Anodized Aluminum, CNC Machined Washers: Nylon. We do ask that the item is unused and unmodified. CNC Precision machined aluminum Spikes to replace OEM fasteners. 1 Set = 10 Spike Bolts and 10 Washers. Spikes: Gold, Anodized Aluminum, CNC Machined. We do ask that the item is unused and unmodified. CNC Precision machined aluminum Spikes to replace OEM fasteners. 1 Set = 10 Spike Bolts, 10 Wellnuts, and 10 Washers. Spikes: Gold, Anodized Aluminum, CNC Machined. Wellnuts: Rubber, Internal Brass Nut. For those Racers counting every gram, use these light-weight, CNC Precision machined aluminum bolts to replace OEM fasteners. Bolts: Red, Anodized Aluminum, CNC Machined. We do ask that the item is unused and unmodified. OR THERE SAYS QUANTITY OF 5 ETC. ALSO I WOULD LIKE TO SAY THAT I KNOW THERE IS A LOT OF COMPETITION OUT THERE FOR THESE PARTS. WITH THAT BEING SAID I WILL NOT BE BEAT. Fasteners are precision machined, featuring a high quality finish that surpasses our Competition and OEM fasteners in fit and finish. To install the Fastener, remove any of the fairing bolts that you want to replace and again compare their length to the quick release fasteners. M6 Bolts (6 x 40mm) x 5. 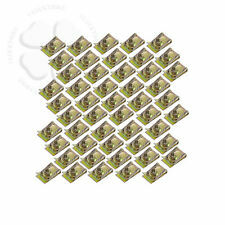 M6 Bolts (6 x 16mm) x 5. M6 Bolts (6 x 20mm) x 35. M6 Washers x 20. M6 Plastic pillar x 20. M5 Bolts (5 x 16mm) x 20. M5 Bolts (5 x 25mm) x 8. M5 Washers x 20. Bracket material: stainless steel. Color: Black. 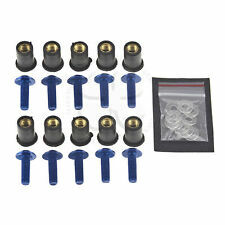 14Pcs Car Door Molding Dash Panel Trim Tool Kit & Clip Pliers & Fastener Remover. We will reply you within 24- 48 hours.